Psarosoupa. I think it was every Greek kid’s nightmare growing up . Now I devour it when the weather gets cold. 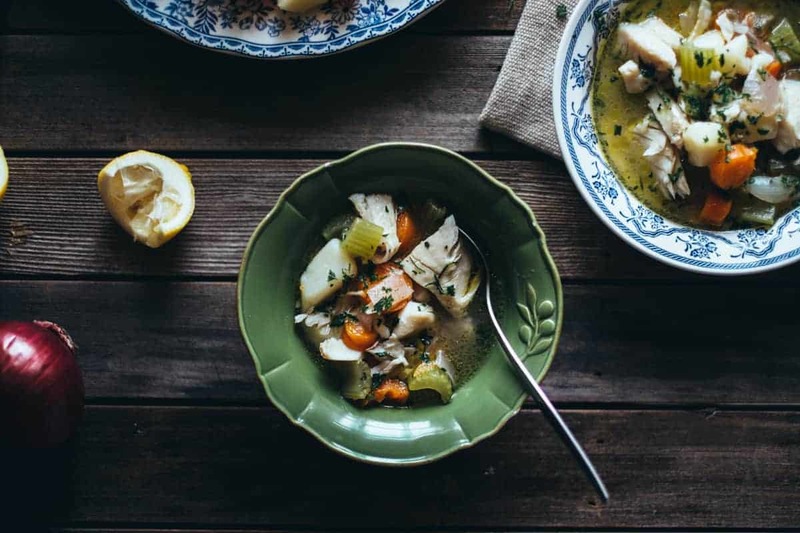 This classic Greek style fish soup is a definite keeper in the cooler months. This psarosoupa recipe falls into the “I hated this as a kid” category! I would even go as far and say that I despised it! And to use an old cliche “boy do things change!”. Psarosoupa literally means fish soup. It’s a simple dish of boiled vegetables and fish. The veggies are usually a combination of carrots, celery, leeks and potatoes. They create a light stock which are then removed and the fish is cooked in the stock along with olive oil. I like to mash up half the cooked veggies which gives the soup a nice natural thickness. I’ve seen versions with rice and even tomatoes and next time I plan on experimenting with these options a little more. When choosing a fish make sure to go for something that’s a little firm such as red mullet, snapper or cod. This is a hearty soup almost bordering on a stew. It’s surprisingly light yet quite filling. I’ll admit that seafood isn’t my first choice when cooking at home and I’m still kind of scared by it! Anyway, hope you enjoy this winter warming “soupa” (as we say in Greek!). Enjoy the weekend and see you next week. Scroll down for the psarosoupa recipe. A hearty, warming Greek style fish soup made with fresh veggies. Place the carrots, celery, leek, onions, potatoes, peppercorns and parsley stalks along with the water in a large pot over a medium high heat. Season with salt and allow the mixture to come to boil and then simmer it on a low heat for approx. 20mins until the carrots and potatoes are just tender. Pour the stock in a new pot and strain the veggies using a fine sieve and place them on a plate discarding the peppercorns and parsley stalks. Place half the veggies back into the stock and mash roughly with a fork. Add the olive oil and fish fillets and allow the soup to come to a boil. Simmer for 20-30 mins depending on how thick your fish fillets are and add the lemon juice. Stir and remove from the heat. Place cooked veggies and fish pieces along with the soup in individual bowls and serve immediately garnished with freshly chopped parsley.